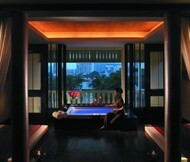 Located on the 5th floor of the Grand Hyatt Bangkok, lies a beautiful oasis in the heart of the city. 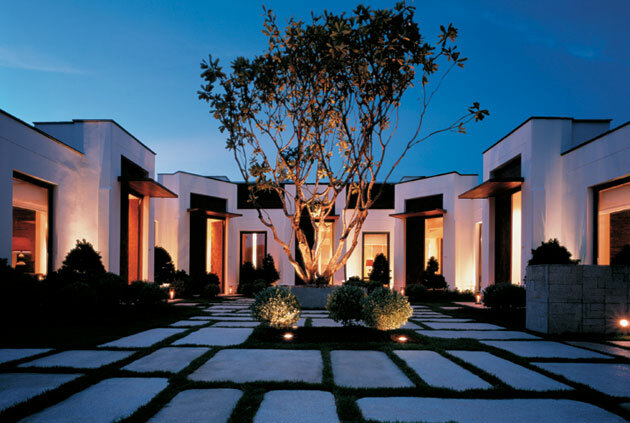 This whole floor is call Isawan, which consist of fitness center, restaurant, swimming pool, garden, spa, and a resort. In Thai belief Isawan is a place for angels. We were there to have our weekly treatment. This time it was the harmony aromasoul massage and the rejuvenate oxygen infusion. We were guided to the Spa cottage which is actually a suite where you could stay there like a resort and it could also be used as a treatment room for spa cottage members and when available. I was lucky that day it was available. The spa cottages has a very charming earth toned interior. 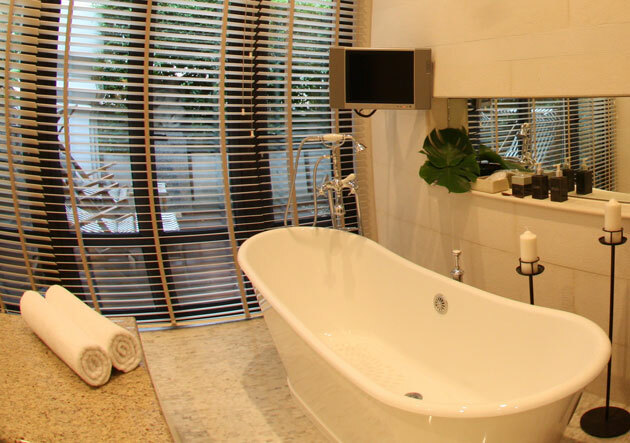 There is the living room, the bed room, a private garden terrace that could look out through the trees to see the busy streets below, and the large bath area that can be convert to a spa treatment area. 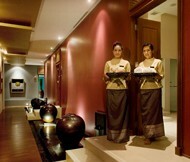 Khun Kik my spa therapist took me to the granite bench near the bathtub to give me a gentle and thorough foot bath. I was asked to select from the 4 oil fragrance for my aroma massage which are Indian, Oriental, Mediterranean, and Arabian. I choose Oriental which had a combination of familiar herbs and spices. The massage started from the back, with the very skilled hands. 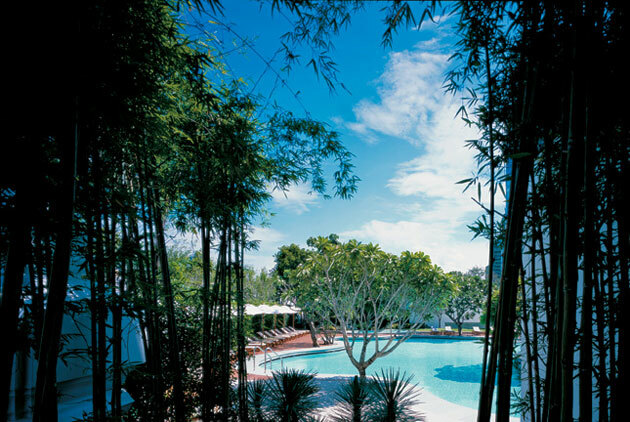 Khun Kik has been a spa therapist for many five star hotels for more then ten years. Her experience really shows on every touch. From the many years of spa treatments she did one trick I’ve never had before. She use her 2 fingers, press and ran it through my back and at the same time made a vibration, it made a tingling sensation and felt really good. After the aroma oil massage was the head & shoulder massage and a surprising bridge back bend which I told her I liked. It is a Thai massage technique that lifts the body up in the air by the knees making the back a bridge and bending it, a compliment from her. The hour treatment went by so fast. 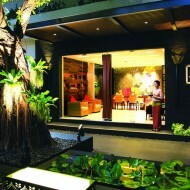 While I was having the massage khun Kung my companion was having a facial treatment “rejuvenate oxygen infusion”. It is facial cleansing and moisturizing process that uses oxygen. 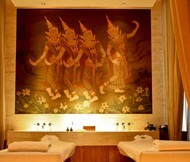 We were told many Hollywood stars uses this treatment and this is the only place that offer this treatment in Bangkok. First the face is cleaned thoroughly then it is applied with many potions of nutrients for the skin. The key of this special treament is the oxygen. The serum that makes the skin shine is injected into the skin by the oxygen. I’ve seen the process, it looks like it is air brushed on a canvas but the canvas on this case is the skin. Does it hurt? No, it tickles. After the treatment she told me that the name of the treatment was a fact. The face was very smooth, shining and rejuvenated. It was time to have some tea, We were offered 4 choices, my choice, mulberry. While having the tea we pretend like we live here for awhile. It was nice. For the name Isawan, I’m not sure if there are any angels there, but for sure it is heaven. 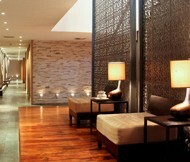 Harmony Aromasoul Massage 60 mins / 2,900 Bht. Rejuvenate Oxygen Infusion 60 mins / 5,200 Bht.